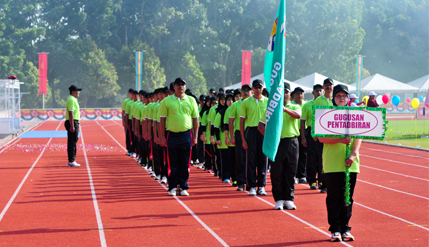 BANGI, 20 June 2014 – The Administration Cluster collecting 12 golds, 8 silvers and 6 bronze medals came out the overall winners of The National University of Malaysia (UKM) Staff Games for 2014 held here over nine days during mid-month. Senior Assistant Secrtetary (Sports) of the Ministry of Education Dr Ahmad Naim Ismail who handed out prizes at the closing ceremony suggested universities compile their own athletes databases for their students and staff. The database could be used to monitor the physical and mental health of their staff and be an additional record to be included in their personal files. The data on student athletes could also be used for sports related research and by the sports industry which may need such data. Apart from the Administration Cluster, the other cluster groups taking part in the games were the Kuala Lumpur Campus Cluster (KKL); Services; Science; Literature; Medical and the Ikhtisas Clusters. The closing ceremony was preceded by 4X100 meters relays for men and women seniors and the veterans. The men and women relays were won by the Administration Cluster while the veteran relay was won by the Services Cluster. It was followed by an aerobics dance performance and a march past culminated with the handing over of prizes to the winners.